Home entertainment today is all about compelling experience, easy access to virtually unlimited content, and effortless use. A smart home theater can serve as the foundation for all the different ways now available to enjoy audio and video content. Sophisticated home automation controls make this new flexibility simple—putting you squarely in charge of your entertainment experience—and all of the other aspects of your smart home lifestyle that you choose. Video Sources & Displays. Watch whatever kind of video content you want (TV shows, sports, or movies), how and where you want (on a video projector in your home theater, flat-panel TV in the bedroom, smartphone or tablet, maybe even a wrist or eyeglass computer), when you want (using DVRs, streaming feeds, or media libraries), accessed from whatever video source you choose. Music Sources & Distribution. The many audio sources available today provide almost unlimited content, along with many convenient ways to listen. Enjoy music throughout your home, in the bath, on the patio—wherever you want— sourced from internet streaming, CDs, digital radio, high-resolution downloads—whatever you prefer. It’s never been this easy. Home Processor & Network. The smart home network (Ethernet or Wi-Fi) is increasingly used to provide a single communications link between all of your entertainment devices—and other automation systems. In smart homes that include lighting control, automated shades, or similar features, a dedicated smart home processor receives information from multiple sources, processes it, and performs whatever actions the information and programming dictate—including integrating it with other smart home features. Then it displays the information. Simple. Smart Monitoring & Control. Once your smart home systems are linked to the network and processor, you can monitor and control them effortlessly at home or on the web—wherever you go—using your tablet, smart phone, or laptop. Use this total connectivity to make the most of your entertainment opportunities, and to enjoy simple world-wide management of your smart home. 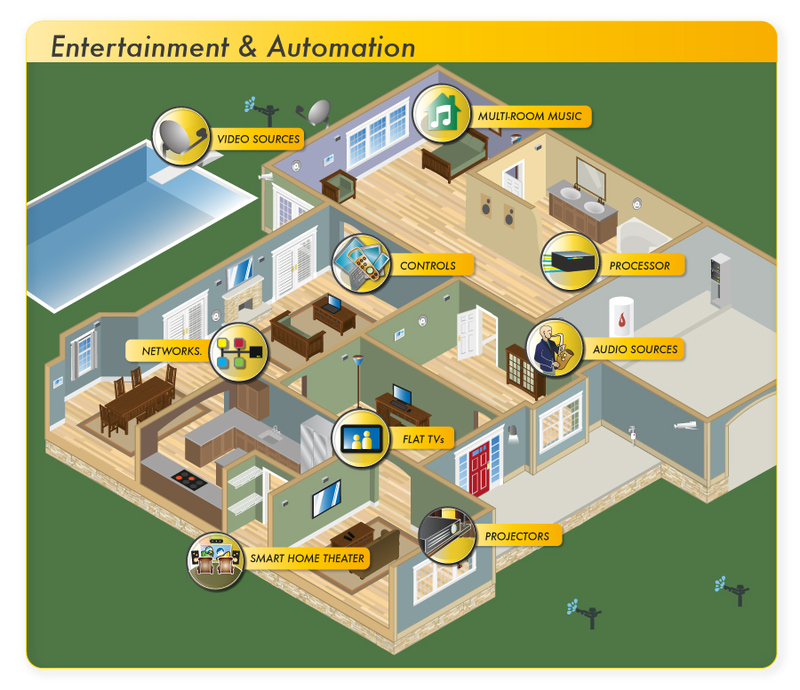 Click on an icon below to learn more about Entertainment & Automation, Smart Home Security, or Smart Energy Management features.